Climb the trapeze instead of the pool fence! I was three years old, climbing the fence to get to the neighbor’s pool, and just like clockwork; another spanking. We lived in the Bronson Canyon under the HOLLYWOOD sign, surrounded by pools. I knew better not to jump in, because we had a 3foot deep cement block wading pool and I was familiar with water, just wanted to be closer to the pool. My Dad realized that my disobedience could not be deterred. Since I was always climbing the large trees on our hillside, Dad wanted to change my focus from the pool to climbing, so he had a gym/trapeze built for my brother and me. The idea worked! New challenges now, and of course, I just had to compete with my brother Archie (2 years older) and try to do what he and his friends could do. My parents never stopped us from doing anything outside! I never heard them say, “Be careful, don’t do that, you could hurt yourself.” Instead my Mom stayed in the house. Good. My Dad often tended his White King Pigeon show birds that were in the same area as our play. The only thing he would say or do was to offer common sense, “Just be damn sure that when you are climbing a tree that you have a good grip with your bare feet and hands (I only wore shoes to school), know the branch you are moving to and the adjustments you need to make before you make your next reach.” (Dad was a doctor, USC) My parents were the opposite of helicopter parents, but my Dad was big on common sense and values. Mom stressed etiquette, respect and manners. Times were different though. At ages 7 to 10, I used to ride my Indian Princess bike down to Hollywood and Vine(across the street from the Brown Derby), lean the bike against the building, and walk through the Broadway Hollywood and use the escalators. When I finished, my bike would be waiting for me where I left it! I had perfect attendance throughout my school years. Dad had a rule: if you are sick, stay home and stay in bed. You may get out of bed only to use the bathroom, and you can read a book. They never told me to do my homework, it was just part of my job to do it well, and then I could escape to play in the California evening. My goal was the honor society each semester. Time for swim lessons. Dad hired Marion and Virginia Hopkins when I was 6 or 7 for private swim lessons at the Hollywood Athletic Club(now a fitness gym). We were the only 4 people in the pool, with a high dive platform! They were professional, pleasant and absolutely no nonsense. We already knew never to talk when an adult was talking, and never to talk back, so lessons went well. They talked to us as if we were much older; no rubber duckies or toys. During the last 5 minutes we got to jump from the high dive platform. In each lesson they taught the 6 beat kick, strong sculling drills and the inverted breaststroke. They said if you could scull well, you will swim well. Now, I think the strong sculling has been the cornerstone of my swimming, especially in the long distance. It helps with grabbing the water and changing hand positions a few times, but also promotes balance and position. Inverted breaststroke taught me streamlining, and balanced smoothness with lots of sculling. Earl Walters and I were visiting one time at a MAC meet. Earl and Gail Roper used to swim at the L.A. Athletic Club. 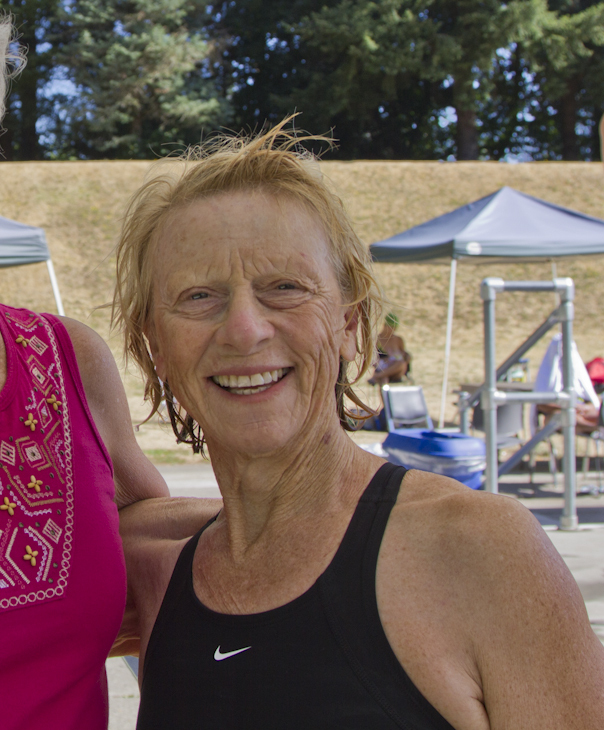 Gail knew of my swim instructors, Marion and Virginia, who also swam and competed at the L.A. Club. Virginia set a World Record in 1938 in the 50Free. Our teachers competed with Esther Williams in the 1939 National AAU Meet in Iowa, breaking the 400meter relay record. The gals, with Esther, set a 300 yard medley relay record at the L.A. Club in 1939. Virginia intended to be in the movies with Esther, but sadly died in 1954. Later in High School, I joined the Synchronized swim team for all 3 years. I am thrilled that this sport is finally recognized in the Olympics! I was married in 1963 and moved to Portland the day we married. In Los Angeles, we could not see across the street through the “pea soup smog.”I tried to take a deep breath and choked half-way; my eyes stung and watered from the burning smog. We drove up the coast in an old truck and flipped a coin to see on which side of the river we would move to. The east side won. In 1972 my husband was injured and spent the next 32 years in a nursing home with a severe brain injury. My little son was 1-1/2 and my daughter was 4-years-old. Our house had just sold, but we had a small down payment on an old homestead past Sandy and up the mountain; replete with wood heat, bats in the attic and 10 acres of timber and pasture. Soon we had all our own cheese, milk and meat from our goats, cows and chickens. We made hay and the animals ate from our land. Our goats loved the blackberries. We drove to orchards to pick peaches, pie cherries, apples, crab apples, pears, you name it. Everything was canned; even all the goat milk was canned for the winter. Some of the old timer women taught me how to make our own bread, jams, pies and cobblers. We had to adapt. The men taught me how to tend the animals, get the firewood, etc. The kids loved the freedom to roam and play in the shallow stream by our home where we found an old still! This lifestyle surely helped me to become a strong swimmer years later. I needed to make money, so went to work for a logger making hand split cedar shakes with a froe (made from the leaf-spring of a truck) and a mallet. I soon went to work for myself, and learned to scale the old growth cedar. I bought small salvage sales from Crown Zellerbach in Estacada and Milwaukee Plywood in Eagle Creek. You should have seen the men at Crown Z when I put my son (still in diapers) on the counter and asked to buy salvage cedar! I was grateful to work from home, making 5 square a day (equal to 20 bundles of cedar shakes), with a waiting list for our taper split shakes, which was now a family business. My children carried off the scrap and spalts, fed the chickens, and picked the vegetables for dinner. The shake bolts were 36inchestall and often weighed 75lbs. With every other split with the froe, the bolt had to be turned end for end to get each taper. It’s ironic that just 9 years prior I was spending most days after school with friends at the beach in Malibu. When there was no cedar, I pulled on the green chain (a lumber sorting process) at Milwaukee Plywood. Pulling too slowly meant that people further on down the chain had to pick up your missed pieces and you were shunned from the lunch room! Often my kids and I would hike 3 times a week. One time we were hiking (off trail) with a group of 5 big men on the Yokum Ridge near Zig Zag when we came across an old growth cedar grove. Five of us with arms outstretched could barely reach the circumference! This kind of a grove was protected by the Forest Service, but unfortunately totally rare in this area now. Some afternoons we would drive up to Austin Hot Springs and sit for a couple of hours. One time was so memorable when large snowflakes fell along with the autumn leaves for the year’s first snowfall. I made a few squares of cedar shakes for Bagby Hot Springs. We knew of most hikes in Mt. Hood forest; my favorite area was in the Ripplebrook Ranger Station area. Bull of the Woods, Pansey Lake, Serene Lake are all wonderful. Pool swimming was not in the picture; we swam in the mountain lakes. I earned my WSI at Shattuck Hall Pool in 1966 when 7 months pregnant. My first job was with Gresham/Centennial school and my test was to retrieve Mike Popovich lying face down in the deep end. This was the last time I ever swam in a pool until the late 80s when I met Alice Zabudsky at the Sandy pool. Alice explained USMS and convinced me to enter my first meet, the State Games. My lifestyle gave me boundless energy and enthusiasm for goals and challenges. In the mid 80s I worked in the shipyards for N.W. Marine Iron Works. It was a long commute and paid only $8.50 per hour. I started on the Exxon Valdez as a laborermucking oil. Looking 100feet up through the ullage I could see the sky, which looked to be the size of the head of a pin. Each day I was working with a new group of men, because they didn’t last long. I stuck with it start to finish. We wore waders past the knee, oil slicks top to bottom and proper gloves. I wanted to work on deck, so I convinced the lead I could operate the pneumatic winch to lift the barrels. The wind was so strong and cold I had to tie myself off to a rail. Soon the Exxon Valdez set sail. The rest is history! Soon they offered me an apprenticeship training to become a Marine Machinist, of course with better pay. I worked on many Navy ships, including the USNS Okinawa, Foster, Hospital Ship Mercy, Love Boats, Merchant Ships and decommissioning USNS Observation Island, a radar ship. I had to carry my 75lb. tool box down those horrible ships’ ladders into the engine rooms and the bilges. One time on a merchant ship some fellows in the engine room ran to me and offered to carry my tool box on down. I said Please! And Thank You! I even got to climb around on the main condenser units, and wear fall protection to clean out the grain silos over the river in Vancouver. (There are countless hours and hours of stories from the shipyards, all funny and all great.) It was sad to see N.W. Marine Ironworks close shop. I love to swim. From1992 to the present I placed in the Top 10 every year but two – one I had moved, the other I moved to Cadiz, Spain, and swam for the Andalusian Masters. I loved the team. We competed in Ceuta, Marbella, Algecerias, Costa Tropicale, etc. Darn fun, and truly a very different swim culture.I am still friends with some teammates. My first All-American was at the Nationals in Santa Clara. No coach yet, but Bert Petersen offered advice on how to swim the 1,500, breaking down the swim into very specific intervals well suited for me.I had 2 weeks to practice the intervals. It worked and boy was I thrilled!I bought a red jacket there and planned to start getting the USMS patches. Those darn patches have sometimes kept me coming back to swimming when I wanted to quit. “Just one more patch,”I would say to myself. There are patches on the back of the sleeves and on the back of the coat. Sue sewed on the first patch in 1992. 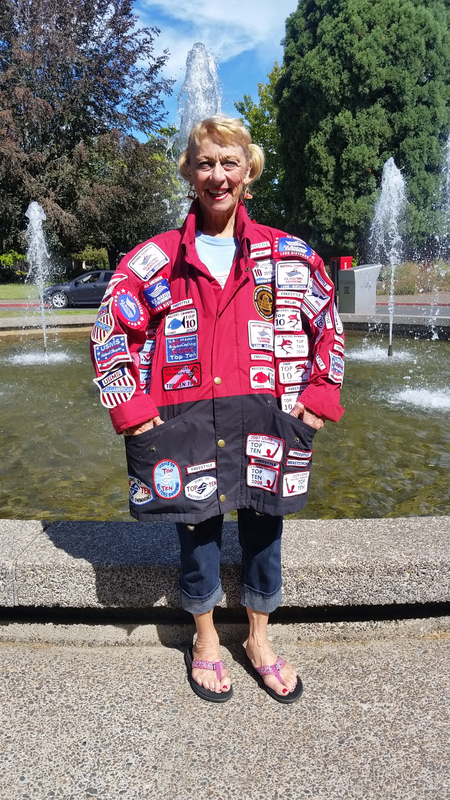 She has patches from the 1985 and 1986 Columbia River Cross Channel Swim. Actually there are a few things that kept me competing. Another was LavelleStoinoff; she was the hook. When I watched this tiny woman accomplish those incredible times I was determined to someday beat her time in just one event. Just one! This past Gil Young meet I missed her 100 meter free Oregon/Zone record by ONE DAMN SECOND. I really smiled to myself over this – just not meant to be YET. I am supposed to continue the “Roadrunner” thing. Meep meep! The third incentive was a “Never, Never Give Up,” framed award Dennis and the Oregon Wetmasters (now Oregon Reign Masters) Team gave me in 2006. This award is the first thing I see each morning and night! It helps my swimming and my life. I had not competed for more than a year due to pain, and the left arm just didn’t work well.I entered the Gil Young meet anyway. I asked Coach Dennis Baker if he thought I could do the 1500 in one hour with the left arm problem.He said I could do it in 30 minutes. He really is always right when it comes to swimming and knowing what each of us can do. Surprise! I finished the 1500 meter free in 28:36.12 and started up the ladder by the judges, when Jackie and Aubrey told me I had broken an Oregon record. I said, “You are lying to me, really?” I was surprised to also break Oregon records in the 50 breast, 50 free and 800 free. I never learned the breaststroke well, so I had taken a few lessons from Dennis. With my first breaststroke lesson I got out of breath going one lap; I was doing it all wrong. Just two lessons were good enough for me to enter the 50 breaststroke and to do it in a good time and not get out of breath. Coach Aubrey also helped with breaststroke advice from the deck, and Colette Crabbe, passionately demonstrated the breaststroke arm movement in the locker room. The team is awesome! I will take some freestyle lessons from Dennis; guaranteed there is always something I will learn from him. Even if you think you are doing each stroke beautifully and correctly, Dennis will help you improve the stroke and your race. Stanford Swim Camp in 1998 was a fun learning experience with Skip Kennedy, Richard Quick and Bill Boomer. I had no idea there were so many components to swimming. My first time to swim the mile at State Games caused real anxiety. The announcer said, “You should be heading to the blocks now for the 1500.” That was my cue! Exit stage left! In a panic I ran to the restroom, locked myself into the first stall and stood on the toilet seat. Next thing I heard was Nancy Milner’s unmistakable voice yelling at me to come out, all the way in from the deck. Nancy said, “I know you’re in here Sue…why is this door locked but I see no feet?” Suddenly she appeared under the stall door and told me to come out and do the race. She quickly marched me to the block as the announcer said, “Stand behind the blocks.” Thank you, Nancy. Since then I have come to love the 1500; try it next time! At first I thought it was boring and thought about a new recipe or a song, but then I learned that each stroke, each wall coming in and out, the entire race is unraveled slowly as you apply your interval training. Your muscle memory knows the speed it needs to go. Don’t go out too fast, fast in and out of the wall, keep the form as perfect as you can, streamline, come up past the flags (not good, but I always have to breathe on the first stroke). Each stroke is thinking and planning. It is more fun if you have someone near you that is your competition, you can stay behind, then pass her at the end to win…other tricks. Love it. The long distance races are a game for me. Give it a go next time! You might even see Nancy! I had one free lesson from Milt Nelms years ago. He told me to swim using my entire body, not just the individual parts. My brain understood the words but they were only words. Not an easy concept for me, but I am getting it.I just finished a new biography of Bruce Lee*. Bruce said, “Real punching power is generated, not from the shoulder and arms, but from the entire body working in unison. The more the muscles relax, the more power they can generate–softness combining with hardness, like yin and yang.”Same deal for swimming as martial arts. Worked for Bruce! Works for me too. The more I practice concentrating on the relaxing phase and the power out, has really made a difference. In 2017 I told Dennis that I had to stop swimming. My left arm just wouldn’t work right and was too painful. I had three whiplashes over the years from being rear ended while at a stop sign. Age 7 I was body surfing with my brother at Pismo Beach when one fierce wave crashed me head first onto the sand. It felt like my neck almost snapped off, I started to faint and the pain was horrible. My parents were on a blanket nearby (they could not swim), but I never told them. I was afraid they would make me get out of the water. I had to lie down and rest a bit, but surely it caused spine damage. Now, 68 years later, there are some problems with my spine, and of course, a worn rotator cuff.I got ticked at myself staying home and not being with the team, so I rejoined and was determined to work on the problem.I had tons of PT and nothing worked. So I remembered some PT from 30 years ago with a shoulder bursa issue. I began that old training at home and it seemed to be helping; so I started training at the gym 2 to 3 days a week working all parts, and especially focusing on the muscles surrounding the left shoulder. There has been much improvement. Now and then the entire left arm and hand goes totally numb, but the feeling comes back soon. The doctors say there is nothing that can be done for it. Lesson learned: There is no free lunch! I learned to take care to strengthen all muscles, especially the ones supporting the main working areas. I work out at least 2 days a week, even in my living room, with small weights. The upper back, lower legs, all shoulder components …the works. I hit it all.It doesn’t have to be heavy body building, just strengthening. Really, it is only common sense; logical. I worry about children’s teams – constant hard practices at such young ages, and racing, but no muscle support training. One thing I had to give up was Open Water Swimming. This is the best ever there was. Swam the Alcatraz in 2009 and trained so hard daily in the Chetco River. I’ve swum many OMS lake races, but my left arm is just not strong enough anymore for currents and waves. Well Lavelle, like the Roadrunner, I’ll keep chasing your times. It has been 28 years trying to beat just one of your times. Looks like the 100free is my best chance.“Never, Never Give Up!” You younger gals coming up…brace yourselves when it comes to breaking Lavelle’s records, it won’t be easy. Meep, meep. Sue, You are such an inspiration at every workout. This article is further inspiring. You are ALWAYS positive and very dedicated. With your commitment, you will break those records shortly!